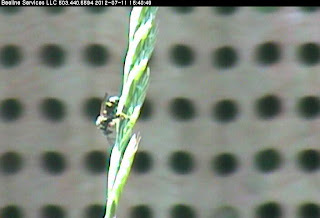 Someone was visiting the webcam today, looking at the pre-set views, the nests and some of the flowers growing around the shelter. I'm not sure who it was, but I hope that you enjoyed your visit to Corbett. At one point the visitor focused in on this individual berry bee resting on a grass stem just outside of the shelter. I saved the image, and probably stopped the updating of the camera for a few seconds while I saved the image to my hard drive. Whoever was looking, I hope that the pause didn't worry you. It's a pretty amazing image from the webcam. Yes, O. lignaria are still active! Are O. lignaria still active?